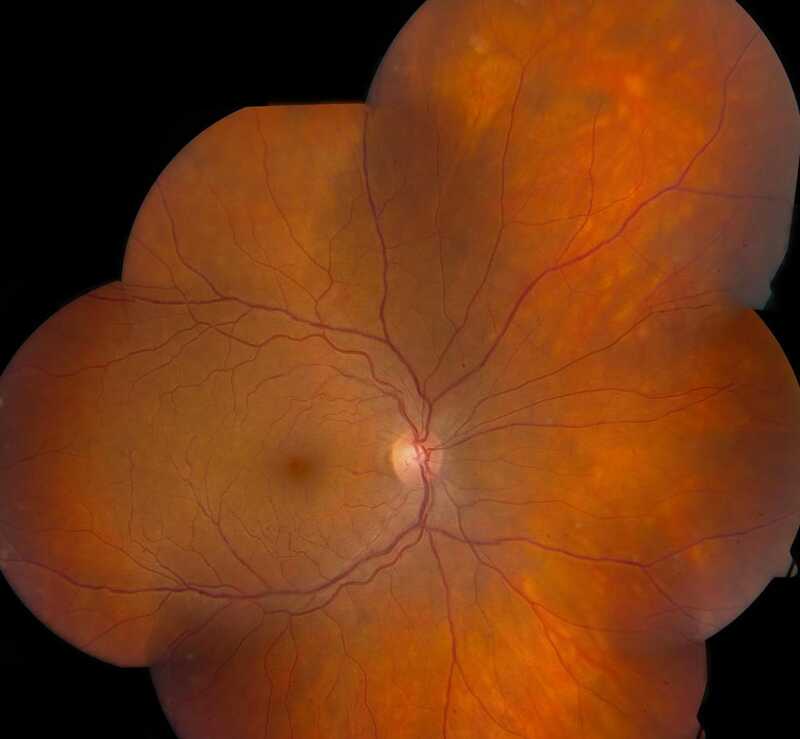 HPI: A 47-year old Caucasian female is referred to Illinois Retina Associates for evaluation of floaters. She reports worsening floaters in both eyes for three months, as well as occasional flashing lights in both eyes. She denies any eye pain. POH/PMH: She has no prior history of eye problems. The patient has a history of hypothyroidism for which she takes Synthroid. Exam: the patient’s visual acuity is 20/25 and 20/20 in the right and left eyes, respectively. Intraocular pressures are 15 and 16. Pupil, motility, and confrontational field examination were within normal limits. Slit lamp examination showed a normal ocular surface, anterior chamber, and lens bilaterally with no sign of anterior chamber cell or flare. Posterior segment examination demonstrated trace cell in the anterior vitreous and vitreous syneresis bilaterally. Optic discs were normal in appearance. The retinal vasculature in the right eye appeared normal, however, in the left eye there was mild venous sheathing and tortuosity. On careful examination there were also small, round, yellow lesions deep to the peripheral retina in both eyes. OCT is within normal limits on both eyes. 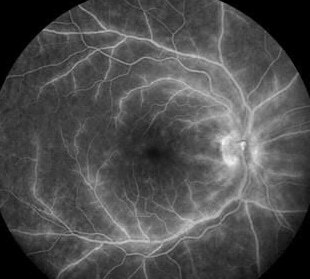 Fluorescein angiogram demonstrated late vascular leakage around larger vessels diffusely in both eyes, suggestive of a retinal vasculitis. 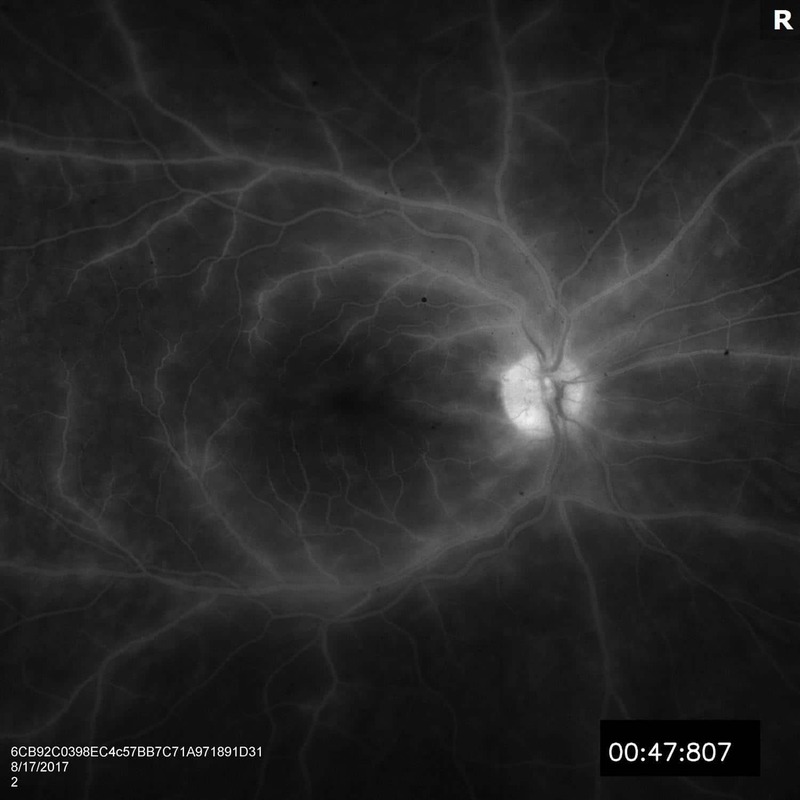 Humphrey visual field testing (24-2) revealed superior arcuate defects in both eyes. Additionally, Iridocyanine Green was performed which showed hypofluorescence of the scattered peripheral lesions in both eyes in early and late frames. ESR, CBC, ACE, Lysozyme, Quantiferon, ANCA, Rheumatoid Factor, Lyme, FTA-ABS, and HLA A29, all of which were normal except the HLA A29 was positive. Chest x-ray was also normal. On further testing, ERG showed mildly abnormal scotopic B wave amplitudes of 187 and 143, and 30Hz flicker latency was 30.5 and 32 in the right and left eyes, respectively. A diagnosis of Birdshot Chorioretinopathy was made based on the characteristic fundus appearance with scattered yellow “birdshot spots” throughout the mid-peripheral retina, along with positive HLA A29 testing, presence of vitritis, and ICG showing typical hypofluorescence of the above mentioned lesions. A reasonable suspicion for masquerade syndrome must be maintained until response to treatment is observed, since malignancy cannot be initially ruled out without a vitreous biopsy. Birdshot Chorioretinopathy is one of the inflammatory chorioretinopathies termed, “White Dot Syndromes,” which are loosely related entities grouped together based on similarities in clinical appearance. They generally present with some degree of multiple yellow-white lesions affecting various layers of the choroid, RPE, and/or retina. Specifically, birdshot chorioretinopathy presents uniformly with vitritis, and anterior chamber inflammation is usually absent or minimal. 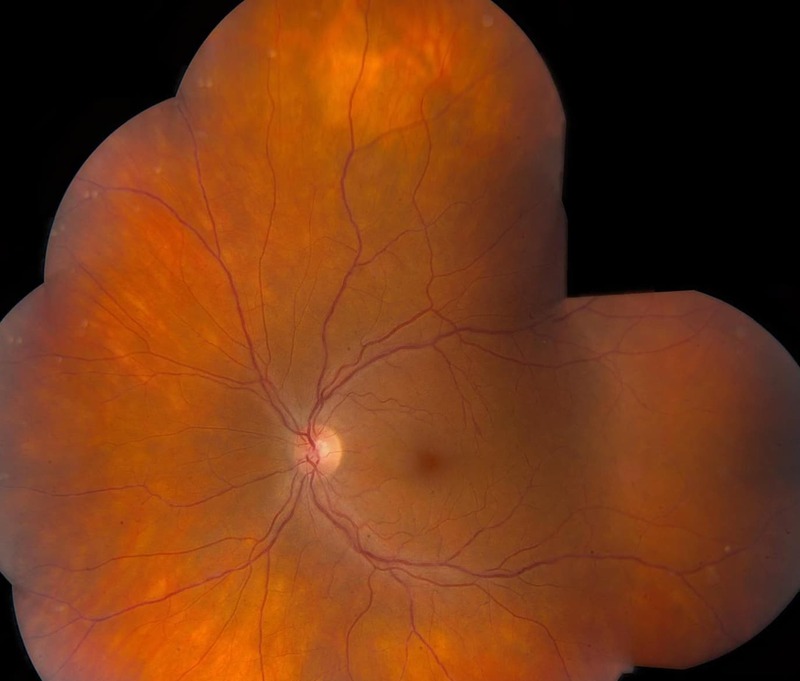 There are yellowish lesions at the level of the deep retina scattered throughout the mid-peripheral retina, usually sparing the macula and posterior pole. Fluorescein angiography most often shows varying degrees of vasculitis, but can also show leakage suggestive with cystoid macular edema. Iridocyanine Green angiography will reveal persistent hypofluorescence of the yellow fundus lesions. ERG testing is also useful for both initial diagnosis and monitoring the long-term progression of the disease. Greater than 90% of patients with birdshot are HLA-A29 positive on blood testing, so a positive HLA typing is very supportive of the diagnosis, however it is not necessary for the diagnosis to be made. Birdshot chorioretinopathy affects women more than men, usually in their fourth to sixth decade of life. Presenting symptoms include nyctalopia, floaters, photopsias, scotomas, and decreased vision. Visual acuity is relatively preserved, however patients often complain of symptoms that seem out of proportion to measured acuity. Most patients have a recurrent course involving multiple exacerbations and remissions. When loss of retinal function occurs it is diffuse, and it is attributed to chronic hypoperfusion and changes in the RPE and choroid. Central vision loss can occur from cystoid macular edema and optic nerve atrophy. Treatment for birdshot chorioretinopathy typically involves an initial course of topical and oral corticosteroids. Localized therapies include intravitreal steroid implants for sustained control of the disease and sub-Tenon’s steroid injections for macular edema. Eventually, it is desirable for patients to transition to long-term treatment on steroid-sparing agents, such as methotrexate, or biologics, such as infliximab. Artornsombudh, P., Gevorgyan, O., Payal, A., Siddique, S. S., & Foster, C. S. (2013). Infliximab treatment of patients with birdshot retinochoroidopathy. Ophthalmology, 120(3), 588-592. Rothova, A., Berendschot, T. T., Probst, K., van Kooij, B., & Baarsma, G. S. (2004). Birdshot chorioretinopathy: long-term manifestations and visual prognosis. Ophthalmology, 111(5), 954-959. Crawford, C. M., & Igboeli, O. (2013). A review of the inflammatory chorioretinopathies: the white dot syndromes. ISRN inflammation, 2013.